Start by cutting two tags from “Classic” paper using Kiwi Lane Tags #5 template. Next cut two pieces of “Classic” measuring 3-½˝ x 4-¾˝. Score the two cut pieces ¼˝ in from the long sides of the paper on both sides to create tabs. Apply Scor-It tape onto the tabs only. Attach the pieces together to create the walls. Cut one piece of “Confection” paper to 3-½˝ square for the base. Apply clear glue to the bottom of the walls and glue onto the base. Cut one piece of “Confection” paper to 4-½˝ x 5-½˝ to create the roof piece. Score both short sides 2˝ in from the sides. To create a decorate edge along the roof, use the Kiwi Lane Large Brackets template to cut along the traced lines. Edge sides of the roof with Memento Luxe Love Letter. Apply clear glue to the top of the walls and secure roof. Trace/cut two pieces of “Classic” paper using Kiwi Lane Tag #4. Use hole as guide for punching holes at the top of the tags. Edge tages with Memento Luxe Northern Pine. 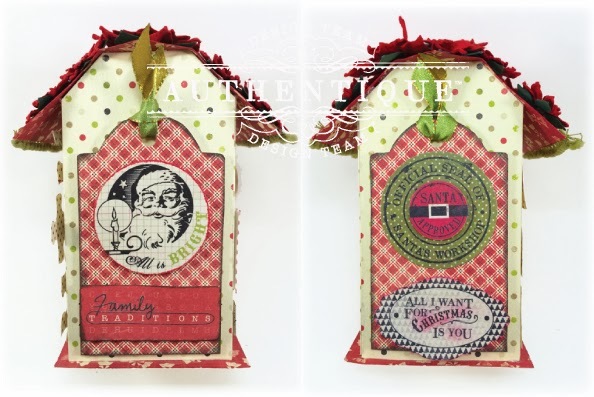 Add decorative May Arts ribbon to tags. 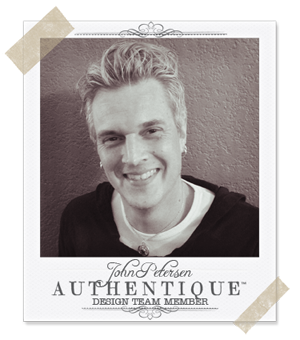 Adhere tags to sides with dimensional tape. Embellish roof with trim and poinsettias from Petaloo. Add Joyous collection embellishments to the house – puzzle pieces, stickers, etc. This line would be terrific for my Disney Christmas photos! I have a birdhouse that I bought last summer and haven't decorated. this would make a great embellishment for the house. I'd also use it for my greeting cards. thanks for the chance to win. This birdhouse is amazing! I just love the puzzle pieces and the cosy Christmas colours. I would love to use this template to make a pretty birdhouse myself to hang in our Christmas tree. 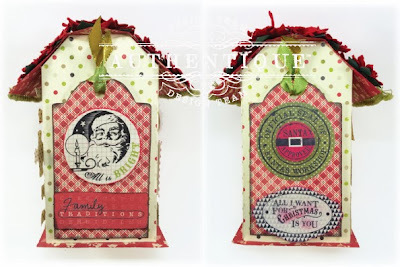 Very creative use of the tag templates for the sides of your house! Forgot to mention what I would do with the templates. I have plans to start a monthly ladies' craft day at church for our community to teach other gals some of the techniques I've learned. I would share my templates there. Fun! Aaaah that is too cute ... love the papers you picked and the puzzle pieces awesome touch! This is so cute! 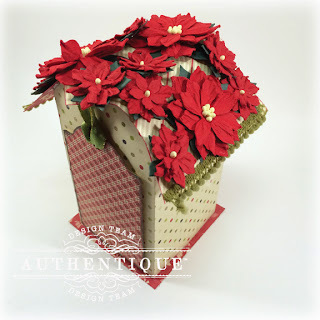 I love the poinsettia roof and puzzle pieces, thanks for sharing. Thank you for an interesting idea! It is so easy to do! 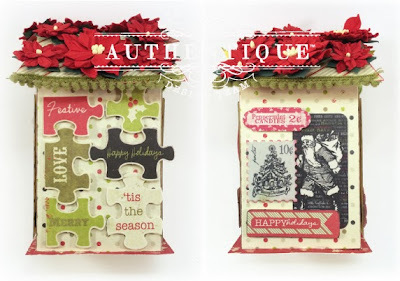 I think that this set is suitable not only for Christmas, but also to other Drafts, if I do other decor! 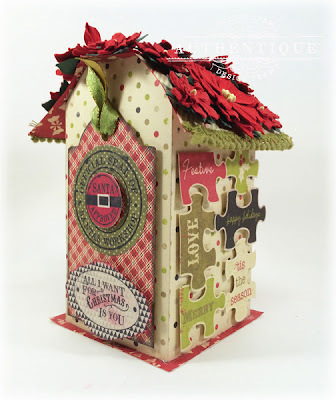 What a creative way to use the tags templates to make a 3D birdhouse! Now that I've seen this, I would use the templates to make my own version! Gosh what an awesome home décor fancy house! This is so pretty and love the embellished roof with trim and poinsettias from Petaloo. Very cool. I love how you used the awesome puzzle pieces on the side. I think I would make a birdhouse with this template . I love the papers you used , those puzzle pieces are so cool. Thanks for sharing.